French warship design and construction has always been of a high standard and the French Navy has long provided a global blue-water naval force equal to the best. It is therefore surprising that remarkably few English-language publications have offered an effective history of key French warship types. This new book provides a thoroughly researched history of French destroyers between 1922 and 1956, beautifully produced with a wealth of images and tables – Highly Recommended. DESCRIPTION: French warship design and construction has always been of a high standard and the French Navy has long provided a global blue-water naval force equal to the best. It is therefore surprising that remarkably few English-language publications have offered an effective history of key French warship types. 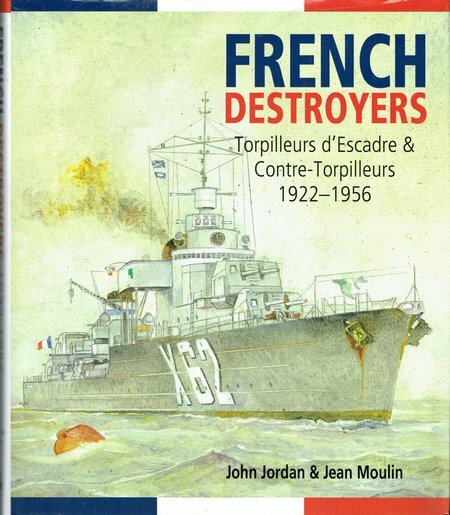 This new book provides a thoroughly researched history of French destroyers between 1922 and 1956, beautifully produced with a wealth of images and tables – Highly Recommended. The first destroyers were small ships with a small crew and a high speed, designed primarily to counter the new torpedo boats that posed a huge threat to major capital ships. Some destroyers of that period were very similar in appearance to some of the larger torpedo boats. However, by the end of WWI, the destroyers had already grown considerably in size and potency, adding new roles to their original missions. The locomotive torpedo posed a serious threat to established navies, not least to the French, because it was a relatively low cost weapon that could be built and operated by nations that had previously posed no threat to the major colonial powers of Europe. The early torpedo boats required only a small crew, were relatively cheap to build and could be constructed in small yards, anywhere in the world. Their high speed meant that they were difficult to catch and their low silhouette made them difficult to sight and track. Following the old tradition of setting a poacher to catch a poacher, the first destroyers had to achieve high speed, be quick to command and carry an effective armament that was superior to the intended targets. However, the locomotive torpedo could also be carried by the frail naval aircraft of the period. The Royal Navy made the first successful drop of a torpedo from an aircraft only weeks before the outbreak of WWI. As the first torpedo aircraft were easy and cheap to build, and required a crew of no more than two, they posed an even more dangerous threat that the torpedo boat. Once they could be carried and operated at sea from aircraft carriers, their threat extended even further than the torpedo boat which was a coastal vessel and unable to operate with a blue-water fleet. At the same time, the submarine was becoming reliable and effective. It was much more costly to build and it required a much larger crew, but it could carry a number of torpedoes, deck guns, and sea mines, operating beyond coastal waters. It was still much slower then conventional torpedo boats, particularly when submerged, where speeds below walking pace were often the best possible. As a result, submarines were really submersible torpedo boats that submerged only to lie in wait for a targets, or to make a covert final approach to the firing position. The destroyer therefore had to evolve to counter all three types of torpedo-carrying systems and that required a growth in size, and an ability to operate against all three threats, even though early destroyers might have to be optimised for one threat, dealing with the other two as secondary roles. By the end of WWI, destroyers had grown in size to meet the torpedo threats and this made them suitable to fulfil other roles. By the 1920s, the largest destroyers were starting to catch up with light cruisers for size and potency, taking up their place as a key element in the screen protecting a fleet, able to operate far off-shore under the worse weather conditions. They also needed to have similar endurance to the larger fleet vessels. The authors have chosen to cover the period from the point where the destroyer had come of age, through to the period of the super-destroyer which was one of the new capital ships, larger than most WWII light cruisers and even some of the heavy cruisers. An extraordinary period of development in which France was amongst the leading innovators. The book contains many illustrations in the form of photographs, sketches, technical drawings and tables. It must become the standard English-language reference book for French destroyers, covering the ships and their weapons systems. A fine effort by the authors and the publishers, producing a book of valued content, with high graphic and production quality.